View from the banks of the river of the ruins of Kirkstall Abbey in Yorkshire. 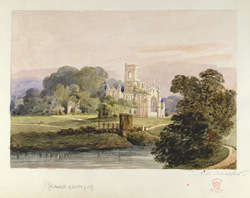 By the late 18th century, many of the buildings of Kirkstall Abbey were surprisingly intact. It is not too difficult to imagine the abbey as it would have looked with roofed buildings from this view. Kirkstall was a smaller Cistercian house, founded in the mid 12th century and the monastic buildings were erected around 1175. Unusually the abbey buildings remained virtually unaltered between this time and its dissolution in the 16th century.